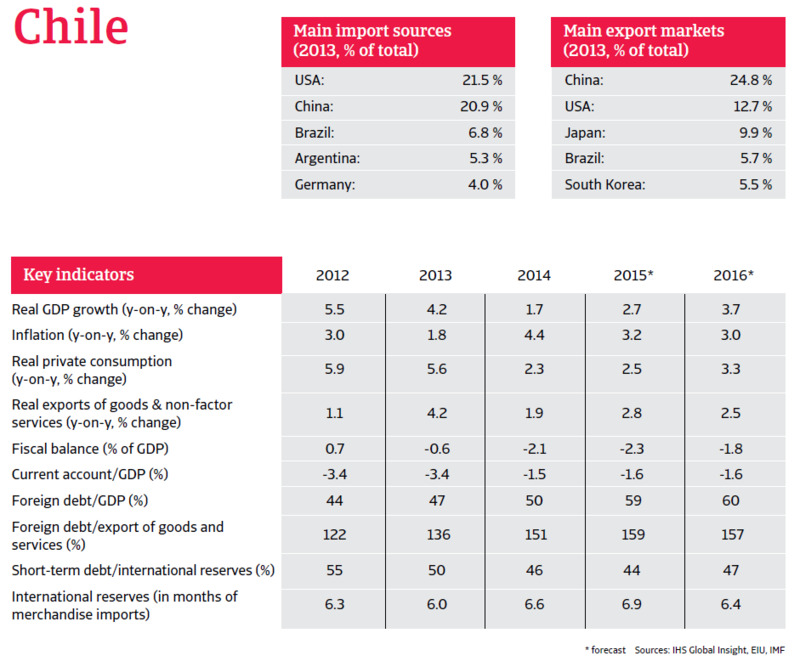 In 2015, Chile is forecast to see a decrease in inflation and an increase in economic growth. In March 2014 Michelle Bachelet, who was already in power between 2006 and 2010, took over the presidency from Sebastian Piñera. Bachelet prevailed in the 2013 presidential election by promising to foster inclusive growth and to reduce social inequality. Since her inauguration she has launched an ambitious policy agenda with reforms in several important areas, including taxation, education, productivity, and energy. President Bachelet succeeded to secure parliamentary approval of her tax reform (increase of corporate tax rate), and is expected to focus on education reform and changes to labour laws in the short-term future. Currently her administration is backed by a comfortable majority of the centre- left Nueva Mayoría coalition in both houses of Congress (68 out of 120 seats in the House of Deputies and 21 out of 38 seats in the Senate). Chile’s open economy is highly dependent on copper exports (accounting for more than 50% of export earnings) and on the global financial cycle (due to its large internationally integrated financial sector). However, the economy´s shock resistance is strong, given prudent macroeconomic and financial policies and low public debt (less than 20% of GDP). 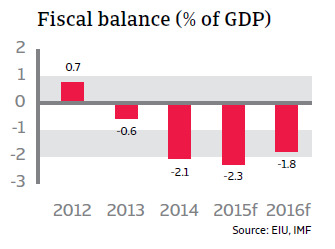 Taking into account Chile´s Sovereign Wealth Fund the state is even a net creditor. Those strengths enable the exchange rate to act as a shock absorber should there be a serious economic downturns and if there is volatility in global financial markets. The Chilean business environment is one of the best in the region and the government continues to stimulate foreign investment with its economic policy. A good infrastructure is a major asset, while regional and multilateral trade agreements have led to a solid increase in foreign trade. In 2014 the economy struggled with some short-term challenges stemming from the end of the global commodity boom (especially lower imports from China) and lower domestic demand, affecting both investments and consumption. 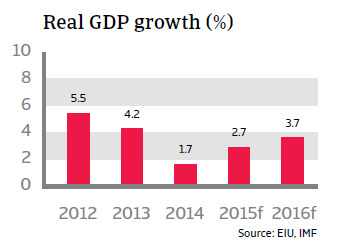 Real GDP growth slowed to 1.7% last year, and inflation increased to 4.3% on the back of several interest rate cuts in H2 of 2014 intended to stimulate the economy. 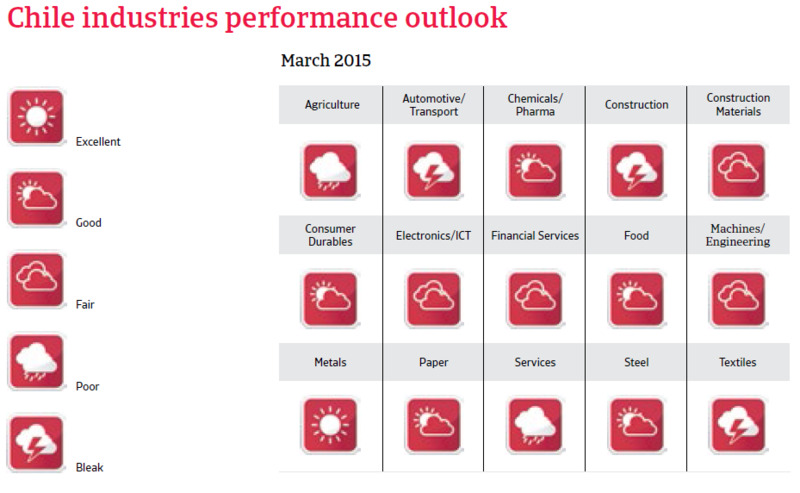 Inflation is expected to decrease again and economic growth to increase again (up 2.7%) in 2015 due to expansionary policies to boost domestic demand, new mining activity and some recovery of external demand. However, given the expected lower demand for copper in the coming years – at least compared to previous years - investment in the country‘s mining sector should be lower than before. Chile´s banking sector is relatively large (assets exceeding 200% of GDP), but healthy, well-regulated and sufficiently capitalized (with a capital adequacy ratio of 13.5%). The credit quality is good, with low nonperforming loans. 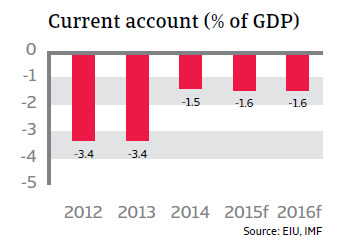 The country´s external economic position is solid, with a low current account deficit, due to lower imports and decreased oil prices (Chile is a net-importer of oil). External debt has increased somewhat, but is mostly longterm and easily manageable (with debt service of 25% of exports of goods and services; 60% of the debt is related to the non-financial corporate sector). External liquidity is sufficient, and access to capital markets is good.